Let her know you’re thinking about her. Let her know your wishes and thoughts for her on every new month. 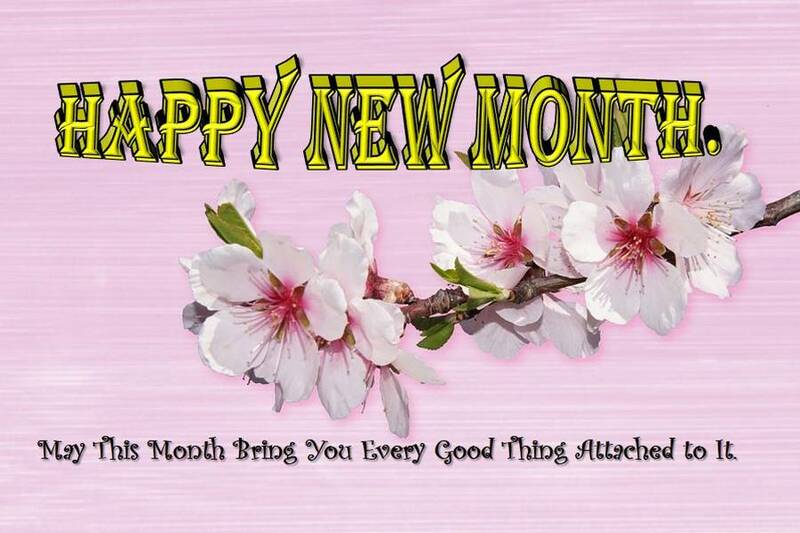 Put a smile on that pretty face of hers with these Sweet and Romantic Happy New Month Messages for Her. Let her know you care with these specially crafted new month messages below. 1. With so much happiness in my heart, I wish you a happy new month, Dear. I pray you overcome this new month. 2. I welcome you to this new month, my love. I pray for God’s goodness upon your life. Happy new month, Sugar. 3. I wish you a healthy new month, Baby. Keep looking beautiful. 4. I’m thanking God for letting us witness yet another month, and I pray that we do not have a reason to regret. Happy new month Baby. 5. May all your dreams become reality this new month. Happy new month. 6. Happy new month to the one who has made my life so bright. I love you so much, Dear. 7. I’m happy for this day. You can’t imagine the joy that fills my heart to know you’re still with me this new month. I wish us many more months together. Happy new month Sugar. 8. 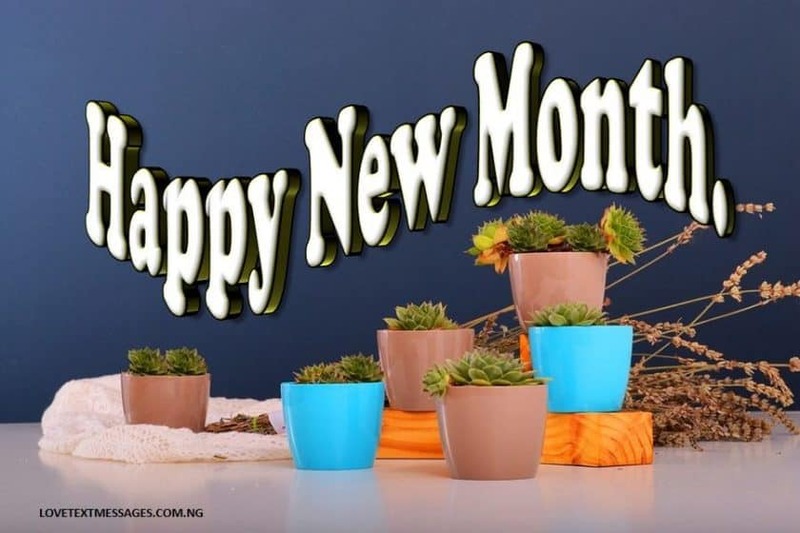 I wish that this new month be glorious and cheerful for you, my jewel. Happy new month dear. 9. It’s amazing how we have been able to scale through the previous months, and I pray we will overcome the obstacles of this new month. Happy new month Sugar. 10. Today being a new month, a new day, a new minute and a new second, I pray that you never have a reason to shed sad tears. Happy new month, I love you. 11. May this new month be a month of abundant laughter for you, my Love. Happy new month. 12. May this month bring you every good thing attached to it. Happy new month. 13. I pray for God’s favour and protection over you. Let him keep you safe not only today but for the rest of this month. Happy new month Baby. 14. As long as the earth keeps rotating months over and over to us, my love for you will remain. I love you forever. Happy new month. 15. A new dawn is here. A new hope is given to us. A new heart is saying ‘I love you anew’. Happy new month, Honey. 16. I am happy we haven’t only made it into this new month, but our love has also come in with us. Welcome to our month, and happy new month to you. 17. It’s a new day, a new dawn and yet a new opportunity for our hearts to beat as one. Happy new month to you, Sweetheart. 18. You’re always in every one of my thoughts and this is another month to prove it. Happy new month Sweetie. 19. I wish you were a movie, so I’d watch you all over again this new month. I love you. 20. To love you the more is my new job this new month, and I pledge to be faithful to it throughout. Happy new month, my Sweetheart. 21. Happy new month to the one with the cutest smile ever. I love you. Kisses. 22. If I’ll be asked to describe your worth this month, I’ll simply say, ‘Incalculable’. Happy new month, my love. 23. The least of what you do brings untold joy into my life on a daily basis. I love you for it all. A happy new month from me to you. 24. Just so you know, you were my fantasy that turned reality. Happy new month, my love. 25. I can’t seem to get enough of you, no matter how much I try. You’re just too awesome. Happy new month, I love you. 26. Happy new month to the one with whom I want to spend the rest of my life with. 27. You sure don’t have any idea how much my heart beats for you, and that’s going to continue this new month too. I love you. 28. To your amazing character and unique personality, I’ve come to say a happy new month. Kisses. 29. Undoubtedly, every single moment we’ve ever spent together has been indescribable. Thanks for it all and happy new month, my love. 30. It’s true we’ve had our good and better moments, but the best is yet to come. Happy new month to you and me. 31. The way a season begins determines its end. Happy new month to you. 32. Our love is magical. It’s indescribable. It controls every part of me and fills my heart with hope. Welcome to our month of deeper love. 33. Loving you gives me joy. And I’m happy this month is another opportunity to display the happiness I have in loving you. Happy new month, Sweetie. 34. My day can’t be empty when I have you. My week can’t be blank when you’re here. Our month can’t be boring when we have each other. Happy new month to us. 35. My heart houses only beautiful things. My eyes see only wonderful things. Happy new month to my Soulmate. 36. Nature has given us the opportunity to continue to love each other by rolling in a new month. Happy new month to you my Love. 37. I am happier since you came into my life. You make things more beautiful and always give me reasons to love you deeper. Happy new month. 38. Every new month takes us closer to the journey of becoming one. And that’s the joy I have every month. Happy new month. 39. I thought I knew all that love entails until I met you. You showed me a more beautiful side of love that I never knew. Happy new month to you, Baby. 40. This new month, I promise to love you deeper than I have ever loved you. Happy new month to you. 41. We are good together. Yes, we are a perfect match. Our love will grow stronger and stronger because we were meant to be. Happy new month to you, my Love. 42. As new months roll in automatically, so does my love for you increase. I’m not trying to love you more. It just happens. Happy new month, my Heartbeat. 43. Months give us the time of the year we are in. But your smile tells me the height of love you have for me. It’s a new month again; never stop smiling. Happy new month. 44. Every one of your thoughts makes us better. Every step you take brings us closer. Happy new month dear. 45. I wish to love you more than I do. Happy new month, my love. 46. Let us do this. Let us love undoubtedly, care endlessly, smile genuinely, and walk hand in hand as we launch into this new month. Happy new month, Honey. 47. I thought nothing could change my love for you, but I was wrong. Many things have changed my love from little to overflow. Happy new month, my Love. 48. I notice my love for you increases by the day. That’s why I’m glad. Happy new month, my Desire. 49. My heart rejoices in the fact that you are with me. I’m happy that we are both stepping into this new month together. Happy new month, Sweetie. 50. What else could have dug a well of gladness in my heart if not that you and I made it into a new month? Welcome to our month, Honey. I Love You. 51. I’ve struggled to tell you how much you mean to me for long and I will continue the struggle again, this month. Happy new month, dear. 52. Here come another 4 weeks to tell you how much your love means to me. Happy new month, sweetheart. 53. Even if I’m quick to say I love you, always know that words can’t just help me enough to express how much I love you. Happy new month, my Heart. 54. Like ever before, I am looking forward to another round of endless merriment in this new month and that’s because I have you with me. Happy new month, Dearie. 55. Since you’ve not ceased to be all that I need every blessed day, I see waking up every day of this month with unparalleled appreciation to you. Happy new month, my love. 56. Obviously, I’m set for another dose of untold care this month. And I’ll not be ungrateful to you. Happy new month to us. 57. You’ve loved my all, even my perfect imperfections, and it’ll be worth it if I’m to say thanks throughout this month. Happy new month, I love you. 58. All over again, I’m giving my all to you. I’m being the best you would ever want in a lover. Happy new month to you. 59. I’ve come to let you know that my life has taken the best shape since I met you. Happy new month to you, sweetheart. 60. I see you in every step of the way. I see you in every move I make. You are my essence and I love you for who you are. A happy new month from me to you. 61. Welcome to another month of success, peace and love for you and me. Happy new month, my sweetheart. 62. You’ve given me so much that I can’t thank you for all. I’m afraid this month will add more and more to my indebtedness. Happy new month to you. 63. The more we grow, the more I find it harder to express my heart to you. You’re all I ever wanted! Happy new month to us. 64. Every single day brings me closer to your heart and I can’t wait to have you as mine finally. Happy new month to you, my love. 65. I keep on loving you because you always give me reasons to love you more. Happy new month to you. I love you. 66. I see us growing stronger in love. Our relationship is made to last. I love us. Happy new month to you and me. 67. I can tell of your personality forever. You’re my one and only. I love you. Happy new month. 68. Our love grows in every passing month and I’ve come to say thanks for your commitment to seeing us come this far. Happy new month, my Heart. 69. I’ll rather be senseless living my life around yours than be a professor to the world, living without you. I love you. Happy new month. 70. I start every month looking back to how we started and I can only say, thank you for staying with me. I love you. Happy new month, my sweetheart. 71. I find so much pleasure in loving you for all that you are. Happy new month to you, my priceless treasure and my inspiration. 72. Soon and very soon, we will be Mr and Mrs, and we’ll be together forever. It’s worth the wait. Happy new month to my future. 73. I love you beyond words because I found out it’s been the best thing that has ever happened to me. Happy new month to you, my jewel. 74. No matter how far apart we are, I need you to know that my love for you will remain unshakable. Happy new month, my pride. 75. My life has taken the pattern I ever wished for, all because it found the best romantic designer. You rock my world! Happy new month to you from me. 76. We were imperfect humans made perfect by the decision to be better at loving each other. Happy new month to you and me. 77. Today, I have vowed to love you with every drop of blood in me. You’ll be the only one that deserves my all. I love you. Happy new month, dear. 78. 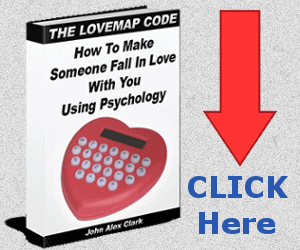 Our love dares all limitations and Impossibilities. Happy new month to you, Honey. 79. Every day brings us closer to the life beyond the planets. I can’t wait to live my life with you forever. Happy new month, Sweetheart. 80. Your love remains a mystery to me; I think I know it all in a moment, then you load me with surprises the next moment. Happy new month to you dear. 81. Just so you know, your love has proven to be all that I’ll ever need to live in this world. Happy new month. 82. My life is worth a living because of your immeasurable love. Happy new month to the world’s best Girlfriend. 83. Your love came when I thought of giving it all up and changed my all. You’re my heroine! Happy new month. 84. Knowing you has been the best thing that ever happened to me. Happy new month to you and me. 85. With every month comes a new desire to be the best in your endeavours. Be the best you can. Happy new month, sweetheart. 86. You can’t be replaced and no one can share your place in my heart. Happy new month to the sweetest person I’ve ever known. 87. You’ve proven it over and over again that you’re irreplaceable. Welcome to a new month, my lifetime crush. 88. I don’t care what other months have brought us. As long as we keep going together, we will grow together. Happy new month to us. 89. I might not be everywhere with you this month, but I’ll be in everything you do. Happy new month to you, my baby. 90. With every second, every minute, every hour, and every day of this month. I will choose to appreciate you because all that your love has brought into my life are peace and quiet. Happy new month, sweetheart. 91. Your love causes wonders and it’s another month of its dose for me. Don’t worry, I’ll be fine. Happy new month, Sugar. 92. Another month has come! And we will forever be together! I love you, sweetheart. 93. No matter how many times I’ve said I love you, saying it again has as much meaning as it has ever had. I love you. Happy new month to you. 94. Can I be in your thoughts again this month? Like I was the previous months? Happy new month to you and me. 95. With every new month comes a new dedication and commitment. Happy new month to you and me! 96. Even if you don’t get as much affection as you desire from me, just be convinced that my love for you hasn’t reduced! Happy new month to you my dear. 97. I know things are hard, we fight more often but I want you to know that we will weather the storm together. A happy new month from me to you, dear. I love you. 98. A zillion of words will be too little to express my love for you. Happy new month to you. 99. With you and you alone will I be forever, even this month. Happy new month to my sweetheart. 100. I’m proud to have you in my life. Happy new month to you babe.